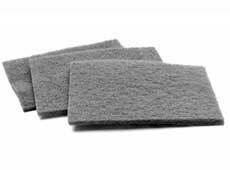 These pads are super-strong - resist tearing, shredding - won't splinter - can be used with detergents and most solvents and will not rust - conforms to irregular surfaces - can be folded to any desired size - rinse clean, can be used over and over again... pads measure 6"x9". Used for blending and finishing of stainless steel and aluminum scratch finishes. Silicon carbide, very fine grade, charcoal grey color. For all-around cleaning and finishing. Imparts a satin finish to aluminum tubing, flats, frames and extrusions. 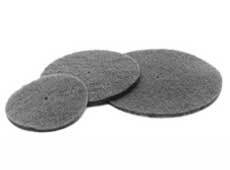 Removes slivers and burrs from anodized aluminum and other materials. For hand blending and satin finishing stainless. Removes rust and corrosion, cleans and scuffs surfaces for painting. Aluminum Oxide, very fine grade, maroon color. For light cleaning and fine finishing. Polishes dies, cleans aluminum, removes fine burrs on threaded metal parts. Silicon Carbide, ultra fine grade, grey color. Specifically designed to provide increased wear resistance and longer product life when used for light deburring. An internal lubricant eliminates smearing in high speed/pressure operations. Approximately 1/4" wide. Aluminum oxide, very fine grade.